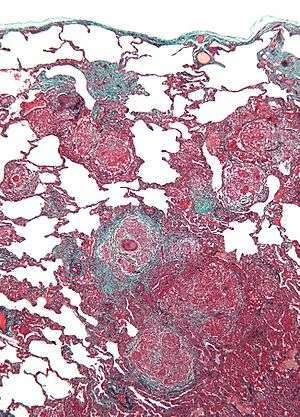 Micrograph of hypersensitivity pneumonitis, the histologic correlate of bird fancier's lung. Lung biopsy. Trichrome stain. Bird fancier's lung is a type of hypersensitivity pneumonitis caused by bird droppings. The lungs become inflamed with granuloma formation. Bird fancier's lung (BFL), also called bird-breeder's lung and pigeon-breeder's lung, is a subset of hypersensitivity pneumonitis (HP). This disease is caused by the exposure to avian proteins present in the dry dust of the droppings and sometimes in the feathers of a variety of birds. Birds such as pigeons, parakeets, cockatiels, shell parakeets (budgerigars), parrots, turtle doves, turkeys and chickens have been implicated. People who work with birds or own many birds are at risk. Bird hobbyists and pet store workers may also be at risk. This disease is an inflammation of the alveoli in the lungs. Initial symptoms are breathlessness especially after sudden exertion or when exposed to temperature change and can be very similar to asthma, hyperventilation syndrome or pulmonary embolism. One of the defining characteristics of bird fanciers lung is that many medical tests will show a normal range of results and it will be identified by X-ray or CT scans showing physical changes to the lung structure (a ground glass appearance). If someone with BFL has been exposed to avian proteins they will see symptoms within 4–6 hours. Symptoms include chills, fever, breathlessness, non-productive cough and chest discomfort. In the chronic form there is usually anorexia, weight loss, extreme tiredness and progressive interstitial fibrosis which is the most disabling feature of the disease as this causes scarring on the lungs which reduces the lungs ability to move air in and out, and as a result sufferers have repeated chest infections and ultimately struggle to breathe. This condition is occasionally fatal. BFL symptoms improve in the absence of the bird proteins which caused the disease. Therefore, it is advisable to remove all birds, bedding and pillows containing feathers from the house as well as washing all soft furnishings, walls, ceilings and furniture. Certain small mammals kept as pets have the same or similar proteins in their fur and feces and so should be removed. Peak flow measurements will indicate a lung condition however a spirometric test on lung capacity and patients ability to move air in and out of the lungs plus in more advanced cases an X-ray test or CT scan is available to confirm whether someone has the disease or not. Steroid inhalers similar to those used for asthma are effective or in cases where the patient finds inhaling difficult high dosages of steroids combined with bone density protecting drugs are used to treat a person with BFL, reducing the inflammation and hopefully preventing scarring. Recovery varies from patient to patient depending on what stage the condition was at when the patient consulted the doctor, the speed of diagnosis and application of the appropriate treatment to prevent residual damage to the lungs and many make a full recovery. However, BFL may reoccur when in contact with birds or other allergens. Hargreave FE, Pepys J, Longbottom JL, Wraith DG (1966). "Bird breeder's (fancier's) lung". Proc R Soc Med. 59 (10): 1008. PMC 1901065 . PMID 6005979.